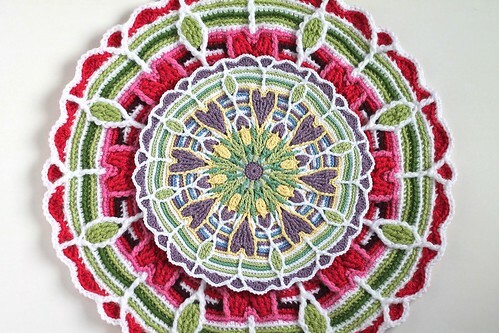 I finished my second mandala for the Overlay Crochet Mandala CAL! I was a little nervous about my hook size and my color choices... but I think it all worked out perfectly! For the crochet specifics, I used Aunt Lydia's size 3 thread and a 1.9mm hook. 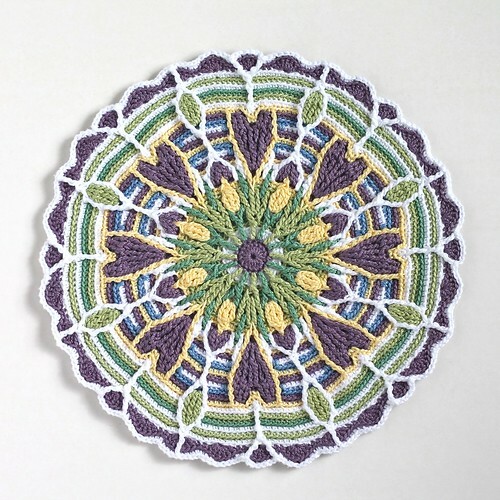 The finished piece is about 9.25 inches in diameter. 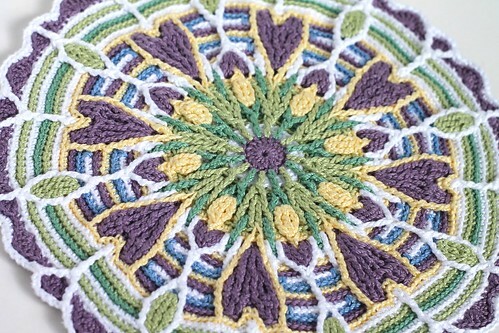 You can see the difference in sizes between both mandalas in the photo above! 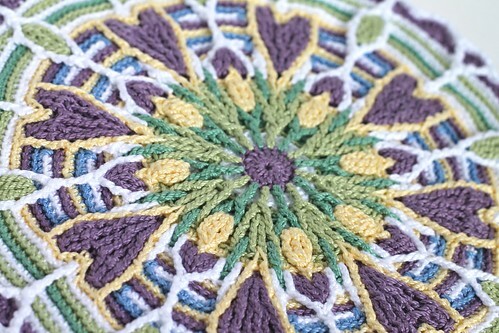 If you want to see everyone else's beautiful mandalas, check out the mandala CAL flickr group! Thank you so much Lluisa! Beautiful work, Kate. I love the way the heart shapes really stand out. The little pointed yellow oval shapes near the middle look like buds and the green ovals like leaves. 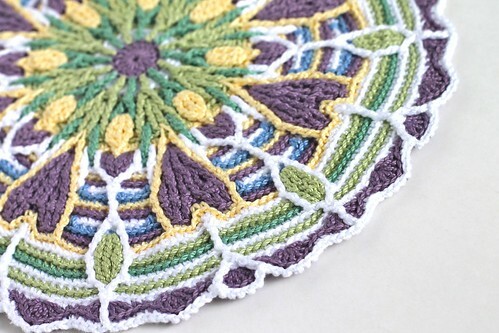 This mandala looks like the earth waking up after winter with the hints of mauve-brown and pale yellow and green and the surrounding red is the inner energy of the earth waking up nature! Oh my gosh... the size comparison is so amusing! I'm still wondering how big mine is gonna get. I might have a rug in the end. I love your color choices. It is fun to see one in warm colors and the other in cool tones. I really had a hard time picking out colors for mine because it was so hard for me to picture in my head how it will turn out. You're getting such a lot of crafting done - you're really putting me to shame! Hola, KATE!!! Es precioso, me encanta el color de esos tulipanes amarillos con corazones negros. Gracias!! I was really happy with how it turned out!